The damage inflicted on your home from a fire can be severe, even if the fire was relatively minor and even if it was quickly contained. The process of putting out a house fire results in water damage to the home. This further complicates the restoration process and may necessitate mold remediation services later on. Plus, the air quality after a house fire typically makes the home uninhabitable, even if it’s structurally sound. Since fire restoration requires specialized expertise and equipment, your first step after a house fire should be to call a damage restoration company near the Hamptons. The shock of a house fire can mask your injuries. If an ambulance arrived at the scene, the paramedic will give you a basic examination. It’s a good idea to go to the hospital for a full evaluation, especially if you may have inhaled smoke. Make sure your home is safe to enter. Never re-enter a fire-damaged home unless someone from the fire department tells you that it’s safe to go inside. Even if a fire appears to be out, it’s possible that the structure can reignite. The fire department will have shut off your utilities. Do not turn them back on unless someone tells you it’s safe to do so. Document the damage with photographs. Before the damage restoration company gets to work, you should document the damage, but only if it’s safe for you to do so. Walk around the exterior of your home and take pictures of any visible damage. If your car was damaged, take pictures of it. While photographing the interior damage, walk carefully and watch out for waterlogged floors and ceilings that may collapse. Fire can damage more of your property than where the fire initially began. Fire and smoke can leave behind hazardous chemicals that could affect your air quality near the Hamptons; fires can also be responsible for future mold remediation, if they are not cleaned properly. Let’s take a closer look at how fire damage can affect your property. 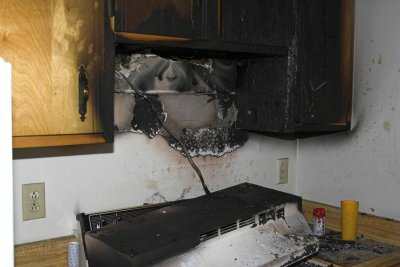 Even a small fire or smoke damage can leave behind a lot of damage. The most immediate and noticeable damages usually occur to nearby appliances, linens, and interior furnishings. If the fire does not reach these areas, then smoke and soot likely will. Within minutes, smoke and soot can permanently discolor your kitchen appliances and window coverings. If left untreated, then these damages can be permanent or even worsen. When fire runs rampant throughout your property, your interior may be completely destroyed. Your walls, furnishings, and décor may need to be replaced, due to extensive fire damage. If a fire does not fully destroy these areas of your home, then you may experience water damage from the water used to put out the fire. Water damage can lead to various problems and destruction as well. If the water used to put out the fire is not properly cleaned, then you may have a problem with mold or mildew in the future. Mold requires moisture, warmth, and bacteria to grow, which can all come after a fire has occurred on your property. 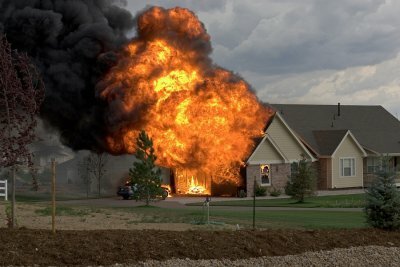 Though the fire may be gone, if you do not have appropriate fire damage cleanup, then you may soon need mold removal. Ensure that the fire, and subsequent water damage, have been removed and dealt with appropriately. After a fire or smoke damage has occurred, your family’s health is at risk. If you do not have immediate fire damage cleanup, then you may be at risk for respiratory problems from various chemicals found in the fire and damaged property. If mold growth is imminent, then your family could be at risk for respiratory issues due to mold spores. Air quality testing is necessary following a fire. Fires can be deadly and cause extensive damage, so taking steps to prevent a fire and knowing what to do if one occurs are essential steps for protecting your family and your home. Be sure that you have working smoke detectors placed throughout your home, and make sure every member of your family knows the different escape routes out of your home. You can learn more about preventing fire damage in this infographic from Island Catastrophe Environmental Restoration, a restoration company serving the Hamptons. If your home does experience a fire, even a small one, it is essential that you schedule professional fire restoration to clean your home and restore it to its original condition. Please pass this vital information along to your friends, family, and neighbors. Dealing with the emotional aftermath of a fire is hard enough without having to worry about how you’ll deal with the resulting fire damage. Fortunately, you don’t have to. There are fire damage restoration companies in Long Island that will clean and restore your home so you can start to rebuild, regroup, and get on with your life after the unthinkable happens. 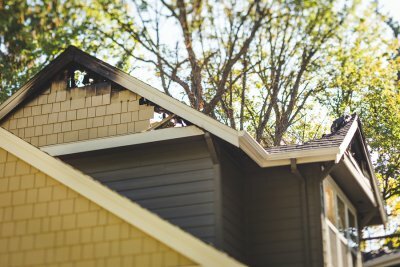 If you are considering tackling the fire damage cleanup on your own or with the help of your friends and family, consider the following reasons to hire a professional fire damage restoration company instead. Ash and smoke, if left unhindered, will cause extensive corrosion, etching, and discoloration throughout your home or business. It can take you days or even weeks to clean up after a fire on your own, which is more than enough time to for ash and smoke to cause even bigger problems. To save valuable time, call the professionals instead. Even if you are able to somehow remove all of the ash and smoke, you probably won’t be able to spot the signs of damage hidden behind the walls or above the ceiling. In addition to structural damage resulting from the fire, there may also be hidden water damage caused by the firefighting efforts. An emergency restoration company will be able to address any and all damage so you can get back to your normal routine. Professionals use heavy-duty equipment and industry-specific techniques to make sure that all contaminants are removed from your home or business. If you attempt DIY cleanup, you may be jeopardizing your health and the health of your family or employees. Mold, ash, and smoke can degrade the indoor air quality and cause various health effects with prolonged exposure. What is the Process of Remediating Smoke and Fire Damage? The effects of a fire can be devastating. Fire damage can permanently destroy memories, valuable belongings, and even entire homes. If you’re lucky enough to still have a home after a fire, there’s still a lot of work to be done before your property is restored to its original condition. Fortunately, you can count on a smoke and fire remediation company in Long Island to help you and your family return to life as usual. Here’s a look at what you can expect during the process of remediating smoke and fire damage. If your home caught fire and was put out by the fire department, chances are you’ll have quite a bit of water damage to deal with in addition to smoke and fire damage. When a disaster cleanup crew arrives after a fire, the first step is to address any resulting water damage to prevent mold, mildew, and humidity problems in the future. If you don’t take care of water damage now, you will have to pay for mold remediation later. The first step is to remove soot from your home, which can easily stain carpet, draperies, and other household textiles. A fire damage restoration company will use heavy-duty vacuums and extraction devices to remove soot from the affected area without spreading it to other parts of your home. Eliminating smoke odor is trickier and requires professional remediation methods such as thermal fogging, a warm chemical fog that penetrates into the home to neutralize smoke odor, and the use of counteractants, which are chemicals or additives that break up smoke molecules to eliminate odors. The last step is to address the structural damage resulting from fire and water damage. A full-service fire and water damage repair company in Long Island will fully reconstruct any structural damage so you can feel safe in your home. If the damage is severe enough, additional contractors may be brought in to repair or rebuild your home.